If you want to be taken seriously as a content marketer, stop acting like a member of the PR team. 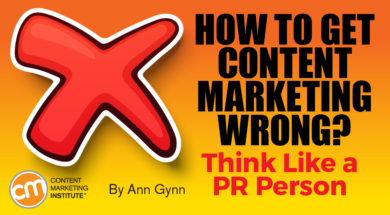 If you want to show that content marketing is a distinct contributor to business results, stop using only PR metrics. Every time you use PR-centered metrics to show the “value” of your content, your content marketing program dies a little bit. Both PR and content marketing as strategic approaches aim to reach designated audiences in a win-win way. But content marketing goes one step further (that’s the marketing part) – to drive profitable customer action. That’s why your reports must demonstrate how content marketing drives customers to act, and that action is not limited to an ultimate purchase. How many people could have seen the content? That’s reach. How many people did see it? That’s impressions. How many times is the brand cited? That’s mentions. Sure, PR measurement lightly touches on what the hands do – “likes,” shares, or comments. But that’s it for engagement. Critics dismiss these eyeball-focused numbers as vanity metrics. They are not vain. They’re useful. They allow PR professionals to evaluate whether their strategic communications are achieving the goal. But for content marketers, those eyeball metrics are vapid if they’re the only ones used. It may be nice to have a bigger reach, more viewers, and more “likes” (or “loves”), but those numbers should lead to some action. That’s the difference content marketers make. Of course, the ultimate goal of most content marketing programs is to get your audience to fork over dollars for your products or services. But typically, getting to that point involves many steps – and you need to evaluate how well your individual content marketing tactics help your audience complete each step. How do you do that? Start by breaking the content marketing journey into four stages – each with its own goal. Then pick the most relevant conversions to measure in each stage. Impressions on social media posts: Identify how many people saw your content in their feeds. “Likes” (or other emotive options) or comments on social media or blog posts: Quantify how many people were motivated by your content to react publicly. Video play rate: Identify how many audience members clicked on the video and began watching. Follows on Twitter or “likes” on your Facebook page: Learn how many people willingly give you access to their newsfeeds. Clicks on internal or external backlinks in your content: Identify how many believed you would connect them to additional relevant and valuable content. Shares or forwards of content: Calculate how many trusted your content enough to distribute it to their friends. Tags on social media: See how many times an audience member credited your brand and wanted you to know it. Video engagement: Discover how much time a viewer gave to watching your video (as a percentage of your video’s length). Subscribers: Quantify how many people invited your brand into their inbox by handing over their email address. Lead-generation forms: Identify how many people were motivated to ask your brand to contact them about a potential sale. Traffic to sales-related pages: Analyze sales-page traffic to see what content marketing vehicles drove them there. Length of sales cycle: Compare how long the sales cycle takes with people who have consumed content to people who haven’t consumed content. CRM data: Evaluate available analytics to see how many customers (i.e., people who have made a purchase) participated in an earlier stage of the content marketing journey (i.e., subscribed or watched a video). You’re a content marketer. Act like one. Don’t settle for eyeball metrics. Develop a thoughtful and well-detailed analytics strategy to better assess your audience’s content journey. If you follow the four stages outlined above – see, do, trust, and buy – you’ll demonstrate a strategic understanding of content marketing’s value to deliver results for your brand. And you’ll have a more viable way to understand what’s working and what’s not to make your content marketing strategy even more effective. And that will earn your content marketing program more than a passing glance from management. Measure up and engage with your fellow content marketers at the largest content marketing event in the world Sept. 4-7 in Cleveland, Ohio. Sign up today and use code BLOG100 to save $100.